Samford University’s A Cappella Choir has been invited to perform at the Southern Regional American Choral Directors Association Conference Feb. 23 in Louisville, Kentucky. The performance is at 3:30 p.m.
After an extensive application process and blind audition, the choir received this prestigious invitation. This is the second appearance for the A Cappella Choir in a regional conference. The first was under the direction of former dean Milburn Price in 2006. According to Philip Copeland, director of the A Cappella Choir, “It is an honor to be selected to present at this conference and to follow in the footsteps of Dr. Price.” Price was president of this organization from 1993-95. Only a handful of university and college choirs are offered spots to perform at the conferences, Copeland noted. There are four regionals and one national conference. Copeland credits the students and other Samford faculty. Copeland also notes that this year’s choir is made up of 21 new members and that they have maintained the high standards of work ethic and performance quality of recent ensembles. This is Copeland's third appearance on the ACDA stage as conductor. Samford University’s A Cappella Choir was founded in 1939. 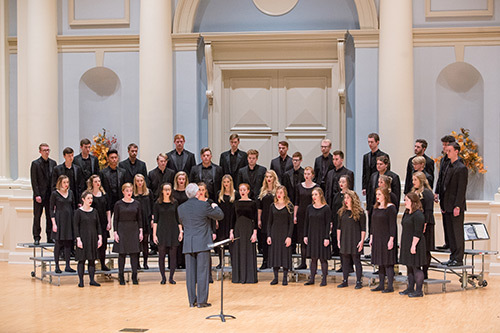 For the past seven years, the choir’s campus performances have been centered around a monthly service of Vespers, a worship event that formally combines the university’s sacred spaces and Christian mission. In addition to these services and other concerts, the choir frequently competes in international competitions, including the Ave Verum competition (Baden, Austria, in 2014) and the Florilége Vocal de Tours (Tours, France, in 2012, 2014). In May 2016, the choir toured Latvia, Lithuania, and Estonia in a trip that included participation in the international choir festival ŠIAULIAI CANTAT, winning top scores in every category entered, the prize of the audience, and the Grand Prix. They will travel again this May to Poland, Hungary and Austria to compete internationally.